Thinking of trying baby led weaning with your baby? We share the dos and don’ts in this BLW beginners guide for starting solids without spoon-feeding. Search any Facebook mom group and you’ll undoubtedly see Baby Led Weaning come up in your feed. 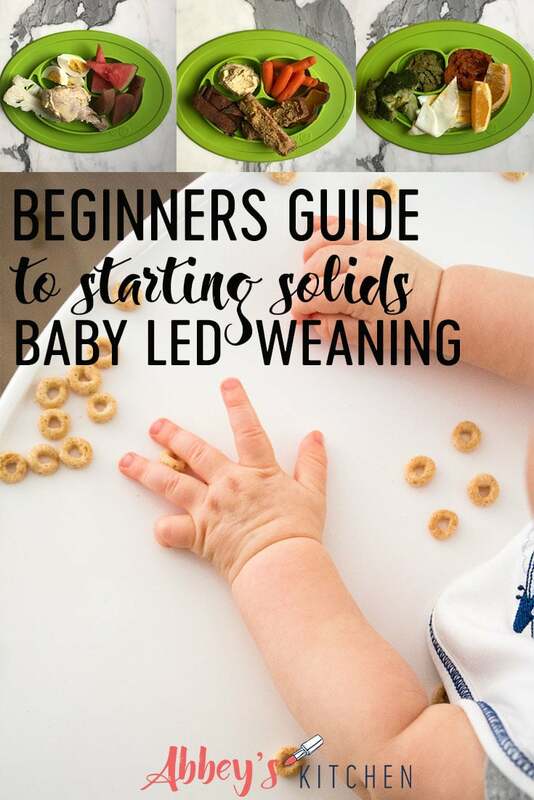 Baby led weaning (or BLW as we like to call it) is a method of starting solids where handheld finger foods are introduced to babies when they start solids rather than spoon-fed purees. This method has always been around (hello, do you think cavemen had store-bought purees?) but has recently been gaining a lot of popularity amongst dietitians, pediatric feeding experts and moms in general. The concept of BLW is based on a long-term midwife and lactation consultant Gill Rapley’s view of infant feeding. Coining the term ‘baby led weaning’, she argues in her publications that just as infants learn to crawl, walk and talk at their own pace, eating should be no different. It should be baby led. If you ask your parents how you were fed, they would probably tell you it started with a spoon. 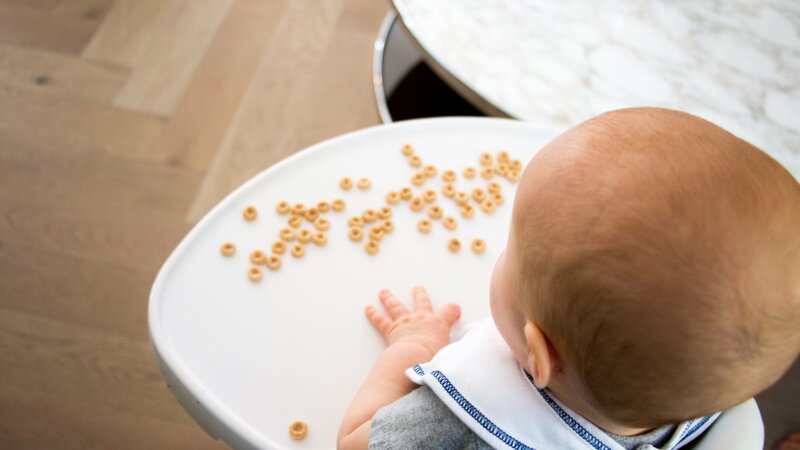 Traditionally, babies around the 6-month mark are started on infant baby cereal or pureed fruits and veggies, spoon-fed by an adult into the baby’s mouth (remember the airplane move?). Once they mastered those purees, parents would slowly introduce chunkier textures until solid finger foods would be served. In baby led weaning, parents can offer a variety of baby-friendly solid finger foods right from the get go. This can include whole pieces of food (like toast), or purees (like mashed potatoes), but the key is that the baby is in control of the feeding (by pre-loading a spoon, for example). The idea is that baby led weaning allows the infant to control their food consumption by ‘self-feeding’ and ‘self regulating’ their intake. So, what is this weaning business all about? It’s a bit of a misnomer, so some experts prefer to use the term baby-led feeding as starting solids does not mean that breastmilk is removed. But rather, it means that solid foods are added in complementary to baby’s milk to ensure that their nutritional needs are met. The child can explore the food options at their own pace rather than being passively spoon-fed by an adult. In the view of infant feeding expert Ellyn Satter, a method like baby led weaning promotes the division of responsibility. The parent decides on what, when and where the infant will eat and should not try to control how much their babe consumes. Infants are responsible for how much and whether they want to eat at all! According to the division of responsibility, it’s more important that we foster a positive eating environment, then worry about how much of every nutrient our baby is eating. What are some of the benefits of BLW? It is important to introduce solid foods by around the 6 month mark because breastmilk or formula alone don’t provide adequate amounts of macronutrients like iron and zinc. Low iron and zinc levels can lead to impaired growth, motor and cognitive development and immune function, hence the importance of paying attention to these important nutrients. 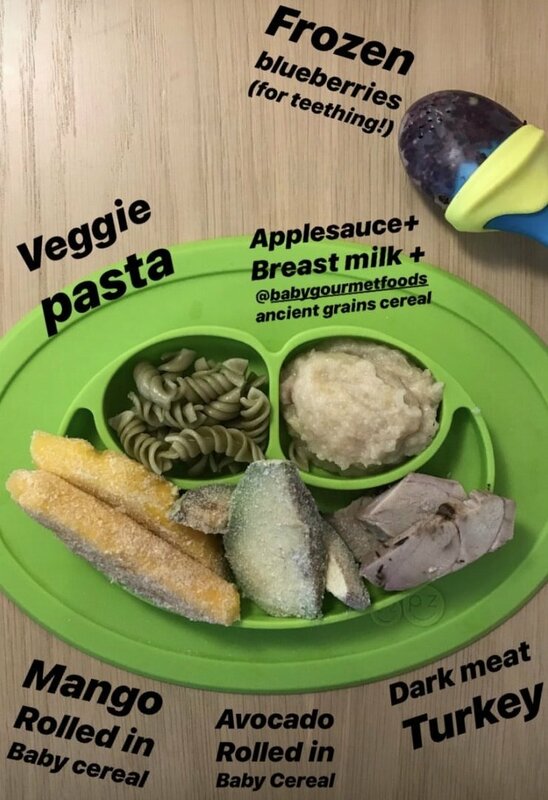 Eating whole foods through baby led weaning has the potential to be very nutrient-dense when compared with some homemade or commercial baby foods which sometimes parents water down. One of the criticisms of baby led weaning, however, is that because babe is in control of her eating (vs an adult being in control), she may not actually eat enough to thrive. But one study comparing the BMI of baby-led weaners to a group of babies fed purees found no difference in body weight or growth. There is also no evidence that either group universally get more iron compared to another, so parents don’t need to necessarily worry about that if they’re staying on their curve. 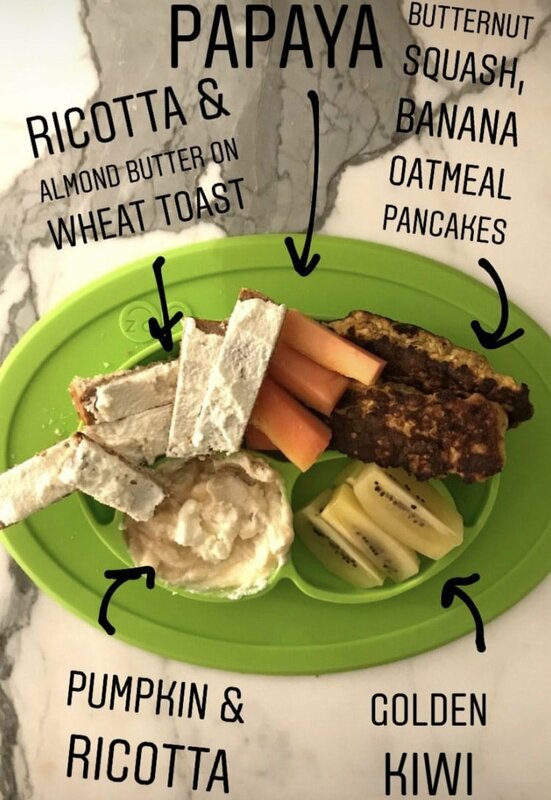 Foods for BLW that are an excellent source of iron for infants include iron fortified cereals, meats, egg, sweet potatoes and beets so you can focus on serving those. The key features of baby led weaning are that the baby sits with their family during mealtimes and are offered the same meals options (in appropriate piece sizes, without salt or sugar). The baby can then self-feed the by using their hands, a spoon or another self-feeding tool like a “boon spoon”. With time, babies can learn, just as we do, that eating reduces their hunger and they will adapt to their new eating routines with their family. One of the biggest advantages of baby led weaning is that it allows babies to have greater dexterity as they self-feed themselves. They develop better hand-eye coordination which leads to independence and less micromanaging from parents during meal time. Winning! Baby led weaning may help improve oral motor skills as they learn to create a bolus (ball of food) and swallow. When an infant eats a new food item, their tongue reflex forces them to lick and taste the food. With continuous practice and exposure, babies learn to move their tongue from side to side the same way we do when we eat. Babies who were fed using baby led weaning are less likely to be picky eaters because they are exposed to different food textures and flavors from a younger age. Since a lot of picky eating revolves around texture issues, introducing a wide variety early on may help minimize this down the road. We talk all the time about the importance of mindful eating for adults, why not build those same skills in babes? One study in this area found that BLW infants had a lower risk of obesity because they could practice self-regulation from a younger age. As a result, they may become more aware about their satiety cues and could use those skills later on in life. Now we have an understanding of baby led weaning under our belt, let’s look at how to get started. Baby should be able to sit up with support and have neck support so it’s easy for them to spit out food. It is important to note that eating is a skill to learn. 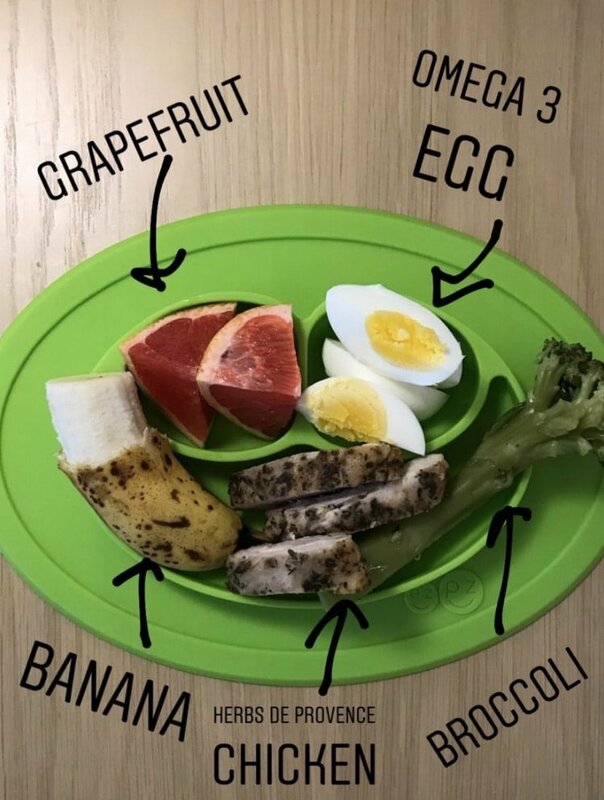 Using some of these instruments (boon feeder, kidsme feeder etc) may prolong that process as infants are not able to touch and explore their foods. If you use them, you may find it’s best to use them alongside simply letting baby use their hands. There is no specific amount of food that babies are required to consume at any point in this process. The beauty of it being baby led is that they will tell you when they’ve had enough, and since breast milk or formula is being continued, they will make up the calories through milk. Infants starting complementary foods should initially consume solids 2-3 times a day between 6-8 months, in addition to milk feeding. The frequency should be increased to 3-4 times between 9-11 months as the infant improves their skills. When first starting baby led weaning, begin with steamed and sliced food so the infant can easily chew and swallow the items. Soft fruits and vegetables should be given initially, followed by gradually introducing lightly cooked harder food that can be easily chewed with bare gums. Soft foods should be soft enough to be mash with the tongue or your finger. For example, great first soft foods might be avocado, banana, steamed sweet potato, steamed carrots, ricotta cheese, and scrambled eggs. 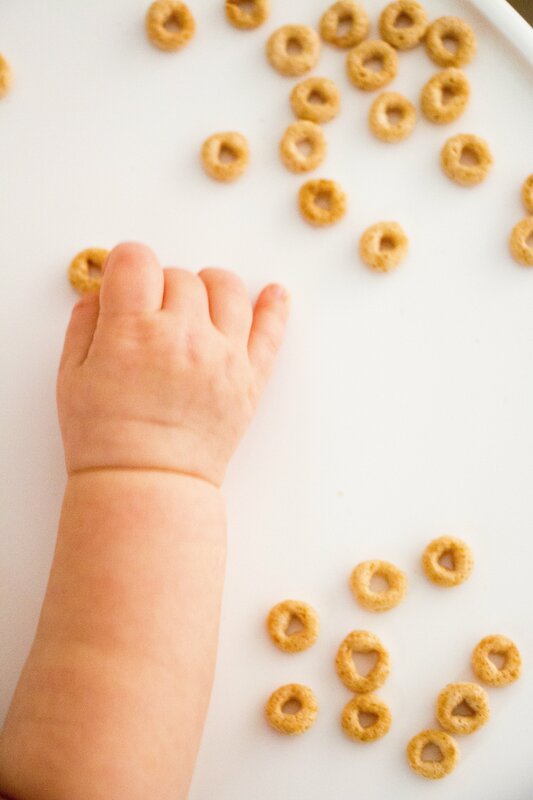 If you find that foods are a bit too slippery for babe to hold onto, try rolling the foods in something like ground flax, baby cereal or ground almonds. Also, water can be offered small amounts during mealtime in an open cup as early as 6 months. This will help them develop their oral motor skills faster than them using a sippy cup which require a similar sucking technique as bottles. Food should ideally be shaped like a finger and be easily able to fit in the infant’s hand with a some sticking out of their fists. Initially, babe will be exploring the food and creating a mess more than eating but hey that’s part of the process. Also, that’s what dogs are for. 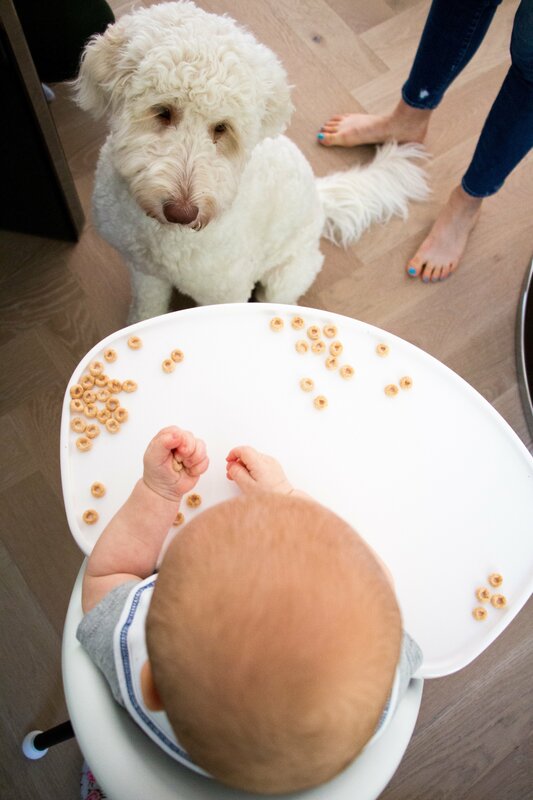 Poppy, my pup, is just as excited as Baby E when it’s meal time. Just like you get bored, babies need their meals switched up, too. Try offering one new food as a challenge for yourself each day for baby to explore. This allows the baby to have a variety of food selection and explore more options, and it allows you an opportunity to see what kind of foods or shapes are working best. Small round foods should be avoided as they can be choking hazards so steer clear of whole grapes, hot dog pieces, whole cherry tomatoes, peanuts and popcorn. 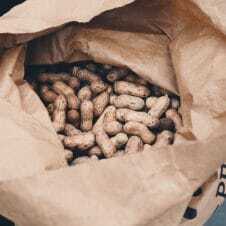 Round soft items like grapes or cherry tomatoes can be cut into quarters but hard items such as peanuts or popcorn should be completely avoided. Some foods that have tougher skins such as apples can be removed to make it a bit easier for baby to manage, and can also be cooked to soften the texture. Avoid foods that form too much crumb in the mouth (like dry crackers) as they can get dislodged in the infant’s mouth. Good examples of food are bananas, avocados and meats as they keep their shape when an infant holds on to them. The goal is to create a routine for the infant similar to the families so that they mirror their parents’ dietary behaviors. According to the BLISS study, babies show an interest in their parent’s activities, including eating and enjoy engaging in the activity. Parents should try to sit down with their babes to show them how eating is done. It’s amazing to watch Baby E follow my lead when I put something in my mouth. Monkey see, monkey do! Once babe starts to turn their head away, close their mouth or get upset when food is offered, they are likely done eating. It’s important not to keep feeding the baby. Parents need to trust their child’s satiety cues and stop feeding the baby when these signs are visible. Worried About Choking with BLW? One of the first things parents (or in my case, grandparents) worry about most when it comes to baby led weaning is choking. This is the number one barrier people have to starting BLW and I totally get why. It’s scary! But the reality is, it’s a lot less likely than you think. When infants first transition to solid foods, they will gag and cough. Babies gag and cough frequently at a younger age because their gag relax is more forward in their mouth. The gag reflex will move back around 6-8 months and be completely developed around 12 months. Believe it or not, research suggests that by 8 months, baby led weaning infants tend to actually gag less frequently when compared to spoon-fed infants.. Remember, eating is a skill that we need to learn and develop. So, the earlier and more frequently your baby practices, the better their skills become! To help reduce the risk of choking, here are some important precautions you need to take. As with everything, parents need to supervise their child during mealtime to watch for any signs of choking. This is not the time to be checking facebook, especially when you’re first starting out on solids. Parents should be able to differentiate choking from gagging. Choking is often silent as infants are not able to talk or breathe, and babe’s nails, lips and skin may turn blue. Gagging, in contrast, is noisy and dramatic as the infant will cough and jump. It is easily triggered and most babies will gag and choke multiple times during mealtime. Don’t be too concerned, this is the body’s best defense mechanism against choking. It’s actually a good sign! Babies should have neck support when starting baby led weaning. A high chair can help to support their posture, allowing it easier for the baby to spit out their food rather than choking on it. The baby should be sitting in an upright position and not reclining downward while a proper foot rest helps add stability and less distraction. As previously mentioned above, foods should not be small and round as they easily to get stuck in babe’s throat. Food should ideally be shaped like a finger so they can easily fit inside baby’s hand with a some sticking out of their fists. Additionally, solid foods options should be cooked and soft as these items are easier to chew and shallow. During mealtime, there should be limited distractions (for you and for babe). Toys should be removed, TV should be turned off and excessive new faces should be minimized while the baby is learning to eat. An infant CPR course teaches parents how to handle any potential choking episodes and is (in my opinion) important for any adult to take who will be watching your child. Parents, grandparents, aunties, nannies and everyone else should be signed up to learn these important skills. This is really just scratching the surface understanding how to start baby led weaning when your babe starts solids. 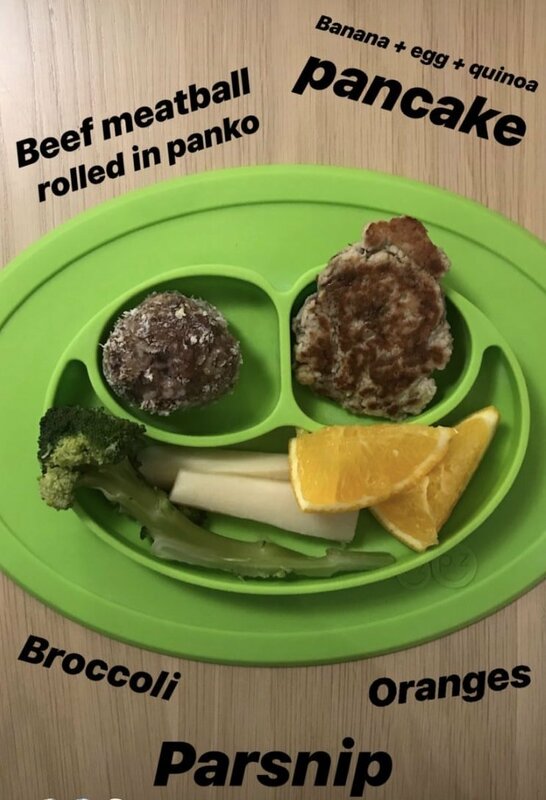 A lot of it is going to be trial and error but I hope this beginners guide to BLW has given you a bit of confidence to get started. 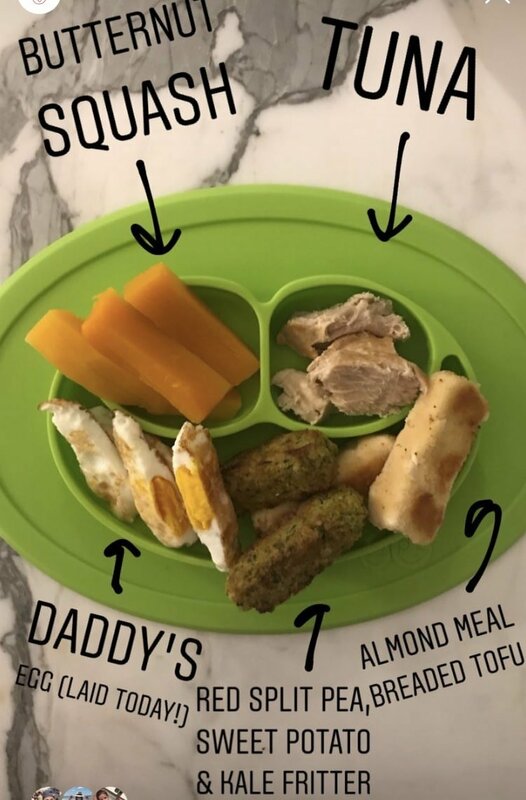 If you follow my Instagram stories, you’ll get lots of inspiration for tasty baby appropriate meals so head on over there to get started. Now mamas, tell me, did you I baby led weaning or spoonfeeding? What did you fin worked best for your kid? My youngest is ten, so I hardly remember! I know with both of my boys I exclusively breastfed until 6 months. Then we did start with baby food, but BOTH of them immediately grabbed the spoons and sort of demanded that they feed themselves, LOL! Great article Abbey. I have a few friends with babies. I need to share this with them. I did not realize there was a term for that! And of course, I can’t remember exactly what I did, but I feel like it was a combo of both with my kids! I do remember that I had a book called Super Baby Food that was like my bible during that time!! Wow, this sounds very interesting! I’m not a parent, but when/if that time comes I’ll definitely look into BLW. 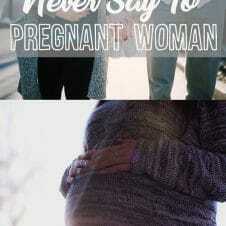 I had no idea this was an issue! Great information! I wish more parents took infant CPR courses–it’s such an important skill to have (but hopefully never need to use)! This age is such an exciting age to introducing baby to new foods. Such a great post.